by Betsy: String Theory : Leaves! It was a week of fall leaves! Two entries for The Diva Challenge. This first is on a Zentangle® Renaissance tile using tangles Flux, Fescu and Featherfall (variation). These tiles look nice with layers. You'll see black and brown Sakura Micron pens, Faber-Castell Polychromos color pencils, General's Charcoal White and Derwent pencil graphite shading. This is my second TrimARim project. Philip at TrimARim liked my earlier post creating my own Zentangle inspired border and sent me more product! One side is a mirror and the flip side is a dry erase surface. This one is the smaller size, 7.5" wide. Here are the steps I used to make it. I traced the border shape with the plastic template that is included with the mirror onto a cream colored lightweight cardstock. I used a leaf punch from McGill to punch out several leaves out of scrap paper. I used Zig 2 Way Glue on one side of the leaves and let it dry. This gave me repositionable stencils that I placed in sections over the border. Alternately you could punch from post it notes. 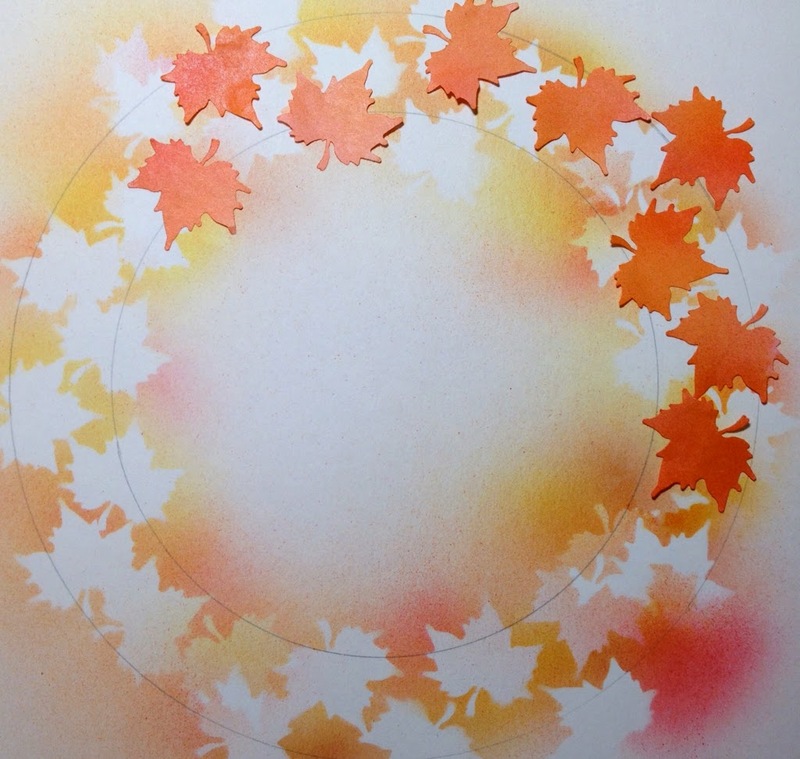 I used my Copic air brush using fall shades of Copics (yellow, orange, red & brown shades) and moved the stencils from one section to the next. I probably did two to three layers of stencils and Copics before I had the result I liked. Alternatively you could use blow pens or spritzers with water and ink. 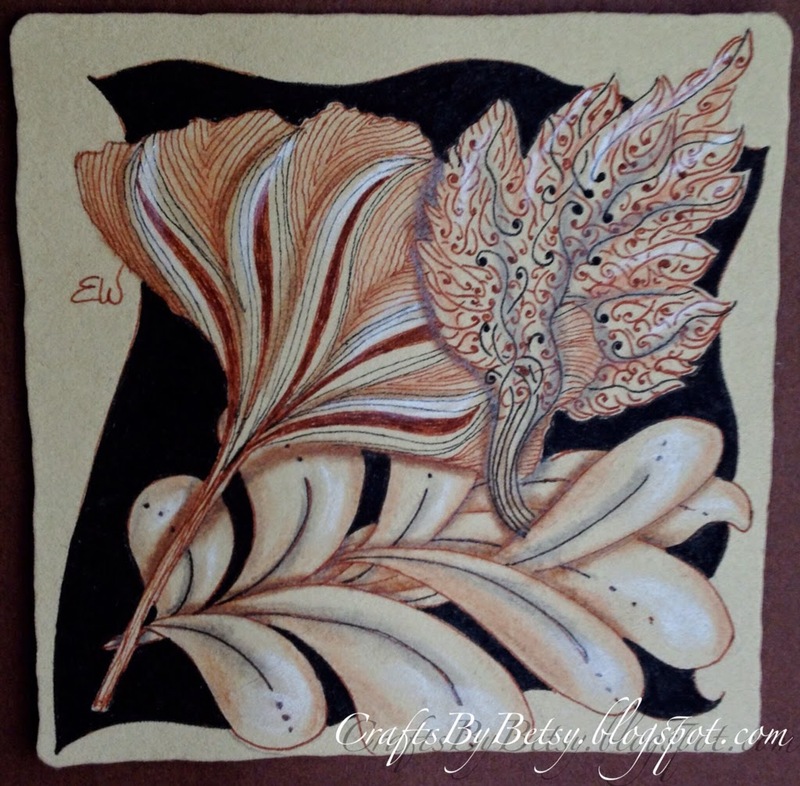 I chose Orlique as the Zentangle pattern, using brown and orange Sakura Microns. The hardest part was determining what sections to tangle and which to leave alone. I did add just a bit of shading around the edges with Polychromos, but mostly the airbrushing provided the shading. On to a card that has a leaf as it's focal point. The leaf is a stamp by Personal Stamp Exchange PSX E-1046. That leaf has nearly every embossing powder I own on it (ok only half of what I own)! 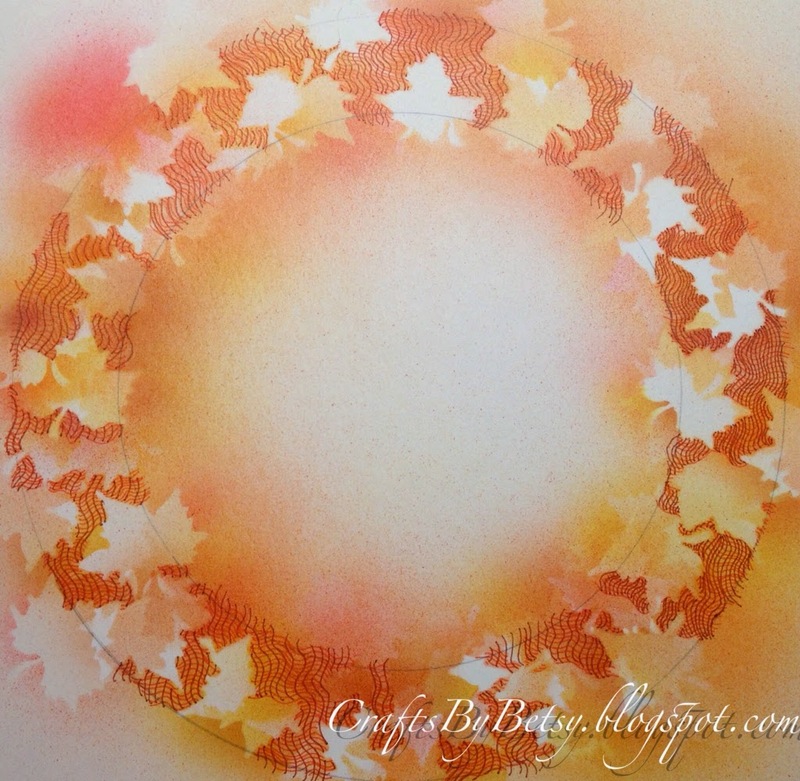 The background utilized a Darice embossing folder and I applied Ranger Distress Ink direct from the ink pad. 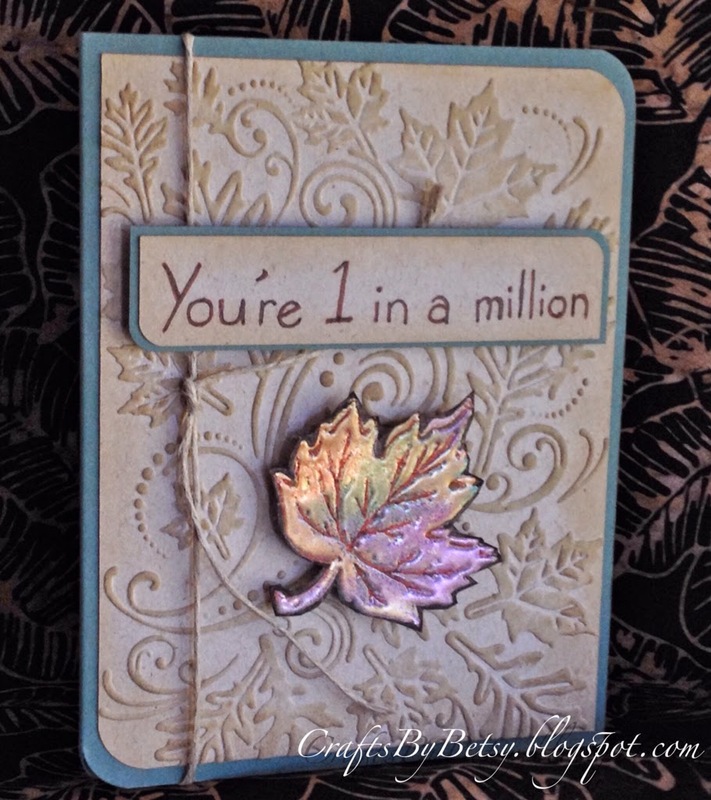 I used Sakura Microns to add the vein detail and the sentiment. So if you made it all the way through my post, you've come to a reward! TrimARim has offered to provide my first blog giveaway! Just leave a comment below. One comment per person and limited to US and Canada only. You have until midnight Pacific Daylight Time, October 17, 2014 to leave a comment. Please note that if you leave it as anonymous I'll have no way to contact you, so please sign in or leave contact info. I will select 2 winners using random numbers. Yes, they're nice at TrimARim. I was going to incur the postage, but they've agreed to handle that as well! So I will either give your contact information to them or they will reimburse my postage cost. The lucky winners will be able to decorate their own TrimARim! I'll post the winners on October 24, 2014. Good luck! I love how you used the Copic air brush for the leaves! Your tile for the diva challenge is outstanding. I just love it! Beautiful work. I love the trimArim and how you have airbrushed the leaves. How nice that the company is offering you a prize to give away. I don't know if kia(google) can actually find me (in case I win! ), so here is my blog: http://www.kiasstuff.blogspot.ca/ You could leave a message with any post because I always check them. I love the ways you fold zentangles into functional objects. 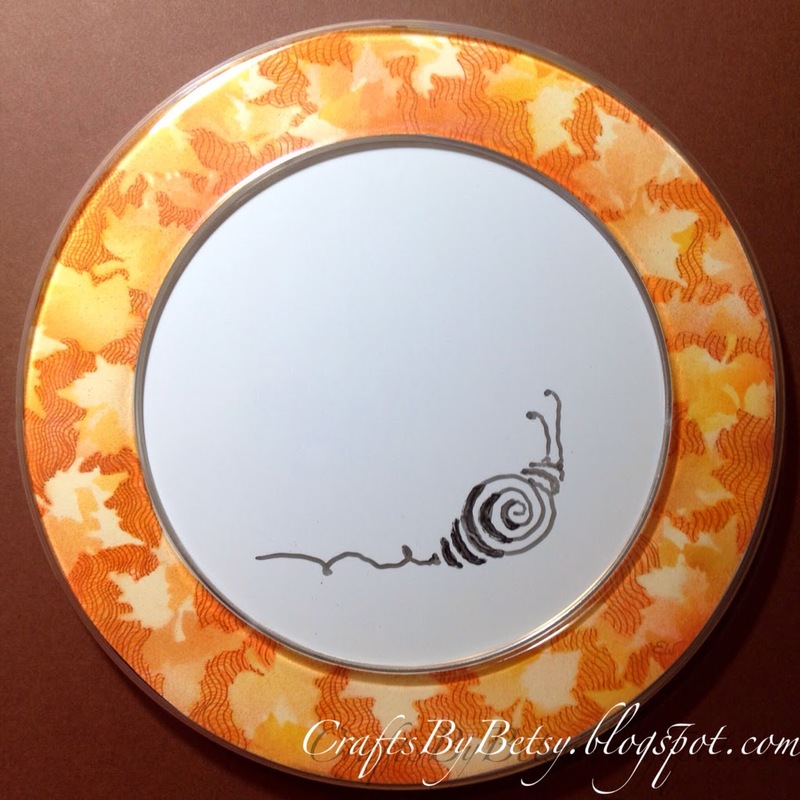 The autumn mirror is gorgeous. Like your tile and the combination of the black and brown with the white highlights. Your TrimARim is really fantastic. Thanks for showing the steps you used. I do not have all those tools, but like the layering of the colors. The tangle just sets things off. Wonderful tile with your leaves! Also I like your beautifulTrimARim project ... Thank you for the steps! I love these leaves on the black background. Wow, you took the challenge to a new level. Your tile is spectacular and I really appreciate your stepping out the process for the leaf wreath. Thank you! I really love those leaves of yours ... all the ideas you had with them are gorgeous and fun. Please note I'm NOT commenting for the giveaway, since I'm in France anyway, but just to say what I feel about what I've just seen here. But being a zentangle-lover, the first is my favorite. Betsy, your autumn leaves border for the Mini Trim-A-Rim is spectacular...love both of the Trim-A-Rim borders you've created and shared, and thanks so much for sharing! Wish I weren't on the other side of the country, so that maybe I could take a Zentangle class from you... I really like how you so clearly explain all the steps for all your projects. Also, in case you or any of your Zentangle friends would like to enter a contest we just launched to design and share Trim-A-Rim borders for a chance to win $250 and other prizes, please check out the "Design & Win" details at www.TrimARim.com/contests. You do not need a Trim-A-Rim to enter, and you can also hand-design the border and simply scan and upload it into Design Studio rather than using any of the resident design elements, if you wish. This particular contest is open to U.S. residents only, simply due to the cost of shipping out the various prizes...we are a small start-up company. Anyway, would love to see lots of Zentangle border entries -- they look amazing! Thanks again! Your tile is beautiful. I like the way you showed your steps for the Trim- A- Rim, and the little Bijou is cute. Your card is equally as lovely. Thank you for sharing and for providing the steps for creating al of these. Your wreath is stunning. 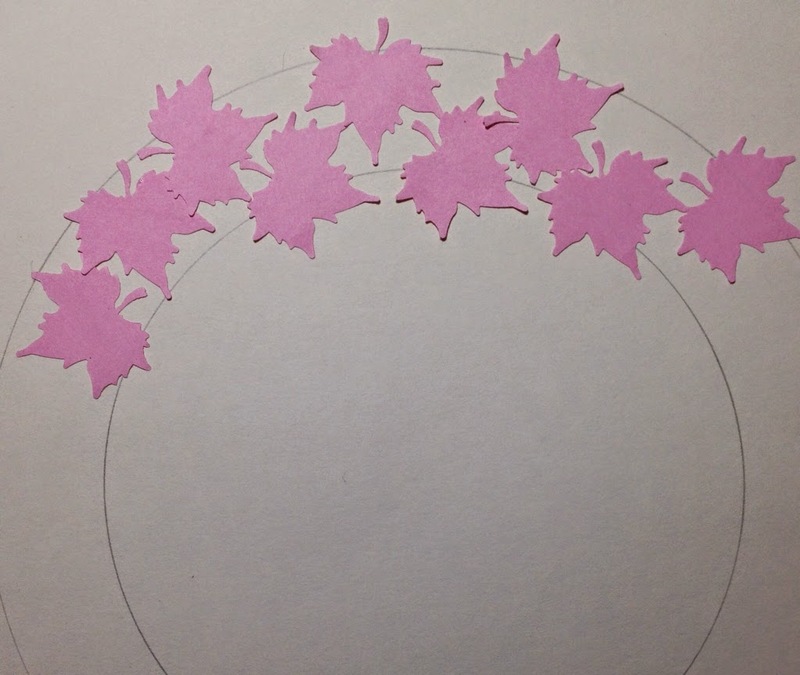 I have been playing around with some die cut leaves for several days trying to get them to be a wreath. Yours has inspired me to keep going. So pretty, I love that orange wreath!